Bevel gears are used where the axes of the two shafts intersect. 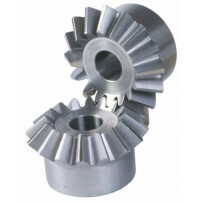 We offer bevel gears in different versions. Standard types and custom designed bevel gears. We can supply different type of bevel gears like Gleason, Klingelnberg, Orlikon and THC.